Cash4Gold Will Offer One-Third of the Actual Value for your Gold: "Since I saw the first commercial, I had a feeling that Cash4Gold might be a rip-off. They advertise during late-night cable television programming and on sports radio. This time slot is pretty crowded with what I call 'red-flag' advertising. Another hint is that their DBA sounds more like a text message than an actual business name. 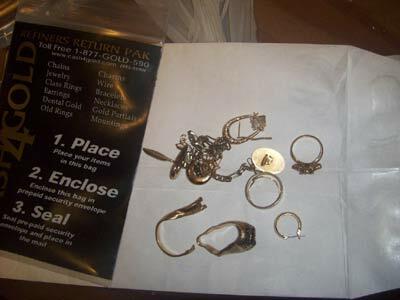 You are encouraged to send your 'scrap' gold in a plastic bag, and to trust they will handle it securely and send a reasonable, near market-rate payment for the precious metal therein. They'll take whatever gold items you have, so maybe it would be too complicated to offer actual prices posted on their website. So, a little test was in order."